U.S. political jamborees alienate Mr. Market. The two parties’ unrealistic extremes may have left Mr. Market scratching his head. Mr. Market would have felt unwelcome in Charlotte and Tampa over the last couple of weeks. The political jamborees hosted in the two southeastern U.S. cities offered stark differences in tone that mirror the different options Americans face in November’s elections. Eat the fiscal spinach served up by Mitt Romney and the Republicans, or gorge on the pro-worker red meat dangled by Barack Obama and the Democrats. Voters may be tempted by one or the other, but investors will probably turn their noses up at both. 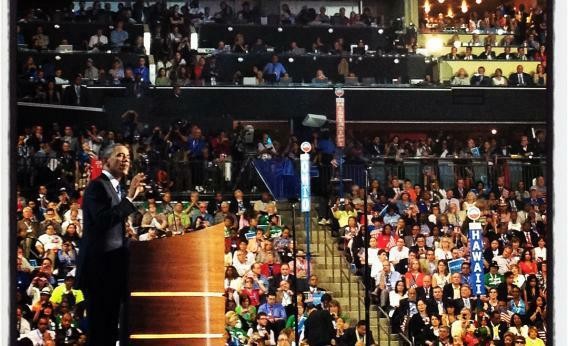 A broad cross-section of America showed up for the Democratic convention, which wrapped up proceedings on Thursday night with President Obama formally accepting the nomination to run again. The party’s diversity was obvious throughout Time Warner Cable Arena, even without organizers jack-hammering the point home on stage. And yet while union bosses, mayors, auto workers, abortion rights activists, firefighters, equal pay advocates and celebrities like Scarlett Johansson got their say, there was little room for Mr. Market. He would have winced anyway at the repeated brags by Vice President Joe Biden and many others about the president’s deal to save General Motors and “more than 1 million American jobs,” which required upending the automaker’s capital structure and trampling on bondholder rights. He would have balked, too, at all the unqualified praise for Obama’s healthcare law, aggressive environmental enforcement and financial regulation. The lack of attention to Uncle Sam’s biggest long-term challenge also would have alienated Mr. Market. How to reduce the nation’s debt load, which surpassed the $16 trillion mark during the Democratic convention, got scant mention during the three-day event and only brief lip service in the keynote speeches of former President Bill Clinton and Obama, whose $3 trillion of proposed deficit cuts over the decade starting in 2013 would all come from collecting more taxes. Delegates from across the country liked the idea of raising taxes on the rich to balance America’s accounts, a populist and impractical notion that could stifle investment and growth if applied excessively. “Desperate Housewives” star Eva Longoria summed up the sentiment on the final day of the Democratic convention. “Eva Longoria who worked at Wendy’s flipping burgers - she needed a tax break,” Longoria said. “But the Eva Longoria who works on movie sets does not.” Wall Street was much less in evidence than Hollywood. The only banker who made a meaningful splash was Robert Rubin, the former Treasury secretary and Citigroup bigwig, who fell in a pool at the Ritz-Carlton. The GOP convention started out all wet, too, with a hurricane washing out the first day. Once the Republicans started, though, they delivered a tsunami of “We built that!” rallying cries, derisively riffing on an Obama syntax gaffe which, taken out of context, suggested the government was responsible for business success. Mr. Market might have shared the disdain of everyone in the (publicly funded) convention hall for this twisted version of what the president said - but he wouldn’t have approved of the political rhetoric that obscured the reality of the issues that concern him. The Grand Old Party’s answer to budget deficits and the debt seems to be as one-sided on the cost-cutting front as the Democrats’ response is on the tax front. Yet even though this essentially means austerity, that word was notably absent from proceedings on the stage. And the Romney approach is also unrealistic. To keep current tax rates constant and reach the Republican nominee’s goal of reducing federal spending to 18 percent of GDP in a decade would require slashing over $6 trillion of expenditure over the period, or some 14 percent of all projected outlays. And that would come from entitlements and domestic programs, without touching defense. That assumes this is the plan - something hard to discern since Romney hasn’t laid out many clear policies or details. Mr. Market probably isn’t impressed with the results of austerity in Europe. And the combination of the political difficulty of achieving it in the United States with Romney’s general vagueness creates just the kind of uncertainty investors detest. The two parties’ unrealistic extremes may have left Mr. Market scratching his head. More than usual, he may even relish the prospect of legislative gridlock. Stocks often do well when Congress is at an impasse, partly because it blocks new legislation or at least keeps it middle-of-the-road. But stubbornly high U.S. unemployment - still above 8 percent in Friday’s jobs report - along with the need for big fiscal decisions at the end of this year and known longer-term problems that need fixes make gridlock less attractive. If neither convention gave Mr. Market much to cheer, at least both parties’ focus on the political meant they did little to no market harm. The S&P 500 Index hit a four-year high on Thursday, and the Nasdaq reached its highest level since 2000 - both largely reflecting new European Central Bank help for euro zone countries, something even U.S. presidents can’t pretend to control. After November, though, the politicians will have to get real again, and Mr. Market will have to get to grips with their choices.